I know, another list, sometimes it is the best way for me to get a little perspective and get my thoughts out. I think if you think of the things you are grateful for, the stressful stuff or the don'ts and can'ts will fall along the wayside. 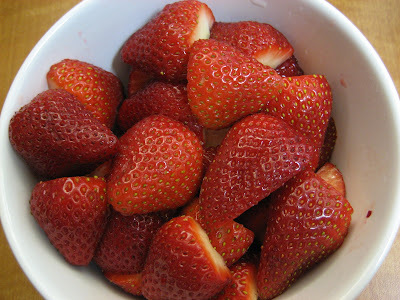 The bowl full of fresh strawberries at my desk right now that came in with the office produce order. My blue kitty - when I was a kid, our art teacher, Miss Alexander had a blue kitty that she would bring in and one day I said to myself, when I get older I am going to have a blue kitty too! Tim keeps telling me he is grey, not blue, same diff in the cat world. My Jeep, gets me to where I need to be. My flat, even though it is under construction and the door was painted shut yesterday when I got home. My friends, they are not all close by, but I thank God for them each day. My family, they are the best and so much fun and super cool as well. These are just off the top of my head at this very moment. Have a nice day and be grateful for what you have try not to focus on what you don't have.